We were deep into the Christmas season and all of the crazy scheduling that comes with the Most Wonderful Time of the Year. Holiday parties, end-of-year office schedules, daycare needs, and endless school events came at me in a deluge of demands on my time and resources. I was struggling with staying organized as a working mom. I needed a serious shake-up, and I set out to find some working mom organization tips that would help me- and my family- keep it all together. One frantic night, I was switching through calendars, emails, and to-do list apps trying to remember what my son needed to bring to the Flag Ceremony volunteer thank-you breakfast at school (which, honest to god, is a real thing. Working mom organization ain’t for sissies). I turned to my husband and told him that I was nearing a nervous breakdown. 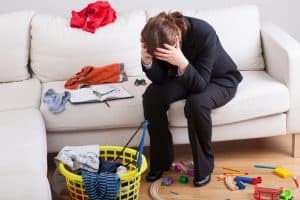 I explained that just trying to stay organized as a working mom with all of the STUFF that keeps our family running was taking its toll and making me seriously anxious. 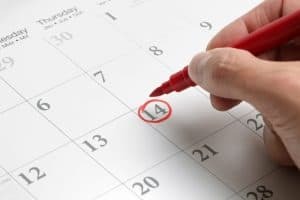 His infuriatingly logical response was “Why don’t you write it on a calendar?” I blinked, stunned. “What, like on paper?” I asked. 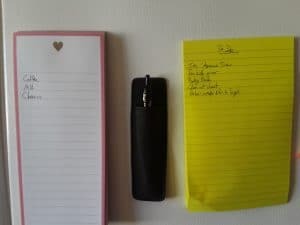 I’ve seen so many working mom organization tips featuring apps and electronics, so going back to paper-and-pencil seemed like a giant step backward. But the more I thought about it, the more sense it made. At work I have my giant desk calendar, my notepads full of lists, post-its stuck to every visible surface. Why couldn’t I do the same at home? And with further thought, I realized that the other thing I needed was for my family to start taking responsibility for some of their own mental load and lessening the burden on me to be the keeper of all the information. 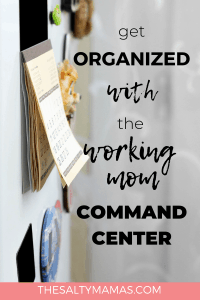 What Is a Working Mom Command Center? The concept is really very similar to a Bullet Journal, but on a larger scale. This is a physical space for me to write down lists, dates, and notes. But the command center has one notable difference from bullet journals: it is not just mine. This isn’t a notebook I keep in my purse and consult as needed. The entire family works on this–participation is mandatory, of course, as per me. First up, you’re gonna need to start with the right supplies. Grab this giant wall calendar and these magnets to stick it to the fridge. 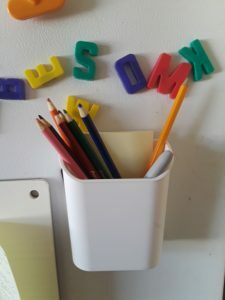 I completed the set with this magnetic pencil cup, colored pencils, post-its, pens, and notepads. 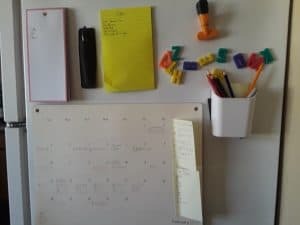 Every single thing I could possibly need to write a note, jot down a reminder, or make a list got a magnet stuck to the back and hung up on the side of the fridge where we all pass it eleven billion times a day. Next step: organize it in a way that makes sense for your needs and the things you need to track. It starts with the calendar itself. Color code your calendar so each family member has their own assigned colored pencil and can keep track of their own events. There is a legend at the bottom to remind my son (and, if we’re being honest, my husband) which color to use for themselves. If my seven-year-old comes home from school and tells me about a class field trip coming up, my immediate response is “put it on the calendar” and he does, in fact, walk over to the fridge and jot it down in brown on the appointed date. 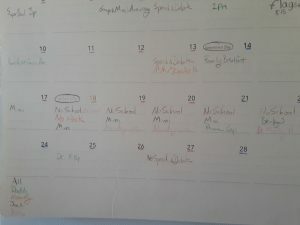 I share custody of my son with his dad and so I underline each day on the calendar in the corresponding color for “daddy days” or “mommy days” so we all know when he’s going to be with us. After the calendar is set up come the notes. Use the little “memo” section on the right of the calendar for sticking on post-its of lists, reminders, and the week’s meal plan. 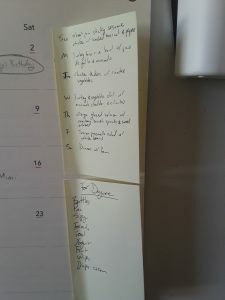 I have a separate notepad I attached to the fridge above the calendar where I keep a running grocery list so it’s not such a chore to put together on the weekend. And a third notepad is used for a running to-do list so that I’m not the only one who remembers that the tires need to be rotated and the sweater that doesn’t fit needs to be returned to Target. On the day the supplies came in from Amazon I made a BIG DEAL of showing them to my husband and my son. I displayed each item and had them help me hang them on the fridge where they could both easily see and access what they would need. I asked them what color they wanted to be “theirs” on the calendar and had my son help me arrange the colored pencils and pens. You will definitely want to make this a positive experience where everyone feels like they’re getting a say; avoid turning it into another chore or, worse, a lecture that they aren’t really listening to. With the right kind of intro, this became a family event that, to my surprise, was met with a kind of excitement (I mean, not Disneyland-level excitement, but at least they were into it!). Depending on the ages of your kids, you may need to modify how you expect each family member to participate. Kids who can read and write can take more ownership of the command center, while younger kids may just listen while the rest of the family goes over the week. At our house, my seven year does need help sometimes finding the correct date, but he knows now to check the calendar every morning when he’s getting his breakfast. Then he can see whether he needs to wear his cammo shirt for “Hiding from drugs” day for Red Ribbon Week (I mean, REALLY?) or bring in the poster for his presentation. He gets excited when he sees “class pizza party” or “no school” coming up. And the responsibility is no longer mine to keep track of it all. Even if your kids are younger, though, this is still a great place to have everything organized and accessible. Of course my ten-month-old daughter isn’t participating, but tracking her appointments and needs myself still helps me share the responsibility with my husband (who is more than willing to help, but who sometimes needs reminders of what needs to be done). I write down a list of things she needs at daycare and my husband uses it to pack her bag on Monday morning; it’s helped us share the workload without either of us feeling as though we’re in it alone. As you begin to use the working mom command center, be flexible and add to it (or subtract) whatever makes it most efficient for you. The more it works for you, the easier it is to rely on it and be consistent. And if you can consistently use this working mom organization tip–and, better yet, get your family to do the same–it’s no exaggeration to say that this will change your life. What does your family use to stay organized? Tell us in the comments below! Kayci Villarreal is the working mom of two incredible children. She and her husband live in Southern California, and their hobbies include doing copious amounts of laundry and drinking coffee while it’s still warm. You can follow Kayci on Twitter for her signature humor, where she brings real-talk on parenting and LOTS of laughs.